In August, VEWH staff were excited to attend the 9th Australian Stream Management Conference in Hobart, Tasmania. The conference brought together researchers, policy makers, consultants and practitioners dedicated to investigating and managing stream ecosystems and their catchments in Australia and provided a rare opportunity for participants to catch up with program partners and academics, to share experiences, new knowledge and lessons learnt. The conference was chaired by one of VEWH's Environmental Water Coordinators, Alison Miller, who is also the President of the River Basin Management Society which convene the biennial conference. "Taking time away from the office which is dedicated to improving our understanding of new science and management practices is important for the continual improvement of the environmental watering program and for strengthening relationships with our program partners." 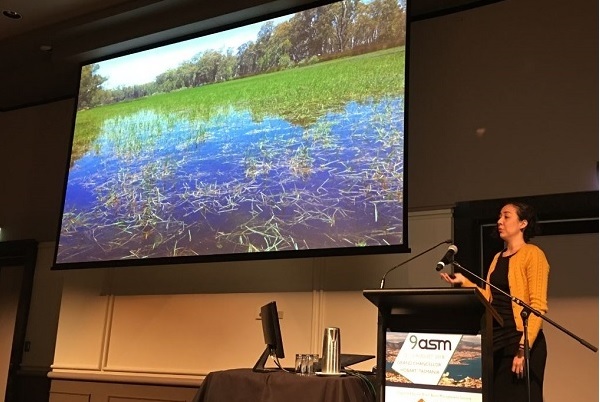 "It was really inspiring to hear of all the great work that the waterway and catchment management industry is doing across Australia," Ms Miller said. Environmental flows featured strongly in the program, with 10 per cent of abstracts specifically dedicated to the field, and many more supporting in themes such as; policy, monitoring and evaluation, wetlands, priority setting and riparian vegetation. A highlight was an invitation from the editorial team for VEWH's Co-Executive Officer, Sarina Loo to present her abstract '"Does anyone here speak water-ish?" – How the benefits of environmental flows get lost in translation' in the Plenary Session on Valuing Rivers. More information about the biennial Australian Stream Management Conference is available on the 9ASM website.